We use a chiropractic approach that focuses on the upper most bones of your spine called the atlas and axis. If your upper neck is not perfectly aligned, subsequent imbalance of body structure will eventuate due to compensatory changes and distortions in spinal function. We rely on 3 x-rays to calculate the degree of misalignment of your atlas and axis. This precise measurement is used to calculate the angle of the adjustment. 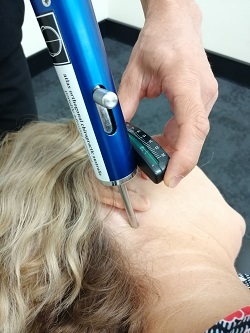 Our instrument delivers a precise chiropractic adjustment. A mechanical impulse is imparted to the metal stylus by means of a spring loaded plunger. This impulse produces a percussion wave through the stylus. At the patient-stylus interface, this percussion wave is transmitted to your atlas, delivering the light pressure needed to precisely move the bone.